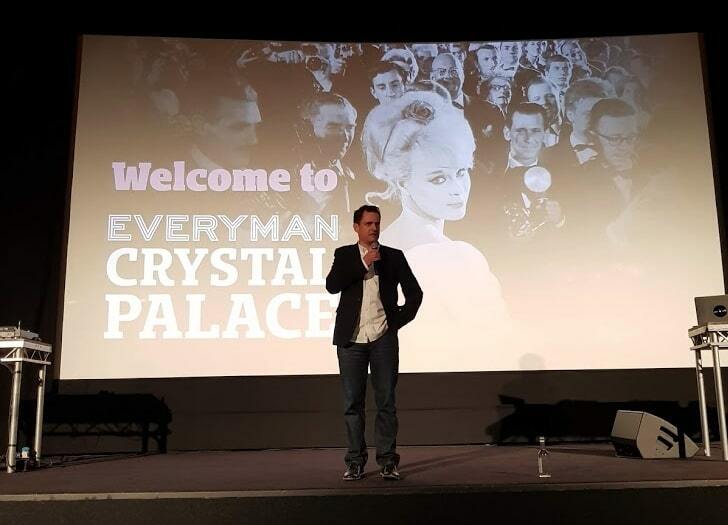 Yesterday saw the opening of and launch party for the Everyman Crystal Palace in south London, the 25th location in the fast growing boutique cinema chain’s network. It was a particularly poignant moment for both Everyman and the locals attending the glitzy event, with Celluloid Junkie’s Editor present to record the historic occasion. It also affirmed Everyman as an undisputed leader in providing some of the most luxurious cinema experiences anywhere in the world today. The Art Deco cinema on 25 Church Road first opened as the Rialto in 1928 in the heyday of cinema. It was later re-named as the Picture Palace, closing in 1968 after which it became a bingo hall (like many other former cinemas in the UK) and was later acquired by an evangelical church. The church faced opposition from local residents (more on this later) and never got a licence to operate as a house of worship, leaving the site in limbo. The building was then acquired by the Everyman Group, which has spent around GBP £3.2 million (USD $4.15 million) to renovate, restore and ready the site for cinema use once again. After a 50-year absence films on the big screen would be returning to ‘the Triangle’, as the hill of Upper Norwood overlooking London is known by locals. Having seen the drawings for what the finished cinema would look like does not prepare you for the stunning impression the cinema makes when you arrive. Lit up warmly from the outside, with large windows showing off the interiors, in a way that makes it hard not to want to go in. Already the entrance hall greets you with sofas and armchairs, indicating that this is not just a place to watch films but to lounge before and after, or even to come here for a coffee or a drink even if you don’t plan on watching a film. This cinema marks the culmination of Everyman perfecting the art of making the most attractive bijou cinemas in Europe today. Everything from the Gatsby-style bar and the plush sofas to the herringbone-pattern wooden floor and soft lighting speaks of a relatively affordable luxury for the masses. Immediately off to the sides of the entrance are two library-like wings (there are even paperbacks on the shelves) that are perfect for a quiet drink away from the bar area that takes up most of the entrance. Everywhere there is seating, seating and more seating in different shapes, sizes and colours. Upstairs there is a second smaller bar area, with a slightly different feel, but no less of an inviting ambiance. Upstairs is also where the kitchen is that prepares the food and nibbles served to the guest this evening and paying customers from tomorrow. Both the Bar, Spielburger and Desert menus offer a great variety that has become Everyman’s USP. Interestingly there are three toilets: two for woman (or ‘Everygirl’, as the sign says) and one for men (‘Everyboys’), meaning that women no longer have to wait and stand in line – a far more meaningful design choice than gender neutral bathrooms. Needless to say the toilets are as stylish as everything else in the cinema. The Picture Palace was prior to closing a large single screen cinema, with a balcony in the back and a stage in front of the screen. This has been tastefully divided into four screens: the main one that retains or restored most of the original features of the old cinema, the upstairs balcony and two smaller screens under what was the balcony. Showing yours truly around was none other than exhibitor design & build legend Max Bell, whose company was responsible for the work on bringing the cinema back from the dead and into the digital age. Screen 1 (left) – 50 seats – NEC 2K projection, Dolby 7.1 digital sound, satellite capabilities, 2D only, hearing assist capabilities. Screen 2 (main) – 148 seats – Sony 4K projection, Dolby 7.1 digital sound, satellite capabilities, 2D only, hearing assist capabilities. Screen 3 (right) – 40 seats – NEC 2K projection, Dolby 7.1 digital sound, satellite capabilities, 2D only, hearing assist capabilities. Screen 4 (upstairs) – 75 seats – Sony 4K Digital projection, Dolby 7.1 digital sound, satellite capabilities, RealD 3D, hearing assist capabilities. Projection boxes mounted in the middle of the ceilings of screens 1 & 3 cleverly manage to project the image under the supporting beam of the balcony above without being obtrusive or ruining the line-of-sight even for the back row. The screen in the upstairs auditorium (4) is tilted to take account of the stadium-like seating, while still fitting neatly within the supporting arch above. Clever design has made the challenges of re-fitting the original single screen invisible and seamless. Yet it is the main screen – Screen 2, as the entrance is between the doors of Screen 1 and Screen 3 – that impresses the most. The stage has been retained and the screen does not take up the full space of the back wall, but the gracefulness of the original design and panels restored beautifully draws the attention to the classic look screen at the front. It is as if at any moment the films that would have played 50 years ago when the cinema closed, “2001: A Space Odyssey”, “Oliver!” or “Yellow Submarine” might light of the screen again – only now they would be flicker-less illuminated by a Sony R515 4K digital projector. While Screen 2 is black-gray-red in its colours, Screen 1 is unashamedly green, with a picture of Peter Sellers hiding naked in the bushes in “A Shot in the Dark” (1964 – so it probably played here) on the back wall. Screen 3 is smaller but still a comfortable size and a good viewing experience, while Screen 4 offers the second-biggest screen in the house that is also using a Sony 4K projector. With four screens Everyman can clearly afford to be ambitious and even adventurous in its film programming, with both mainstream and more art-house films, as well as live events and more. Amongst other things it will be the new home to the Crystal Palace International Film Festival. All the auditoriums pay tribute to the rich British cinema history with its art work on the walls, but an even more important tribute was to come from the stage that evening. After lots of sparkling wine, Old Fashioned cocktails and canapés, it was time for Everyman CEO Crispin Lilly to go on stage and formally welcome everyone and open the cinema. He talked about the history of Everyman, which grew from the one cinema in Hampstead, through the acquisition of the Screen Cinemas, to the mini-empire it is today thanks to the vision of its founder and Chairman Paul Wise. He thanked his team at Everyman and everyone who had worked to bring the cinema back to life. “Who for nine years lead a little group that were passionately set on not letting this building become something it shouldn’t be. (Is that the polite way of putting it?) I met Annabelle a couple of times in the last year and then again three o’clock this afternoon. And she said, ‘Oh my god, Crispin, you and Everyman, you’re just amazing.’ I said, ‘Whoa, back up a bit, me and Everyman only came into the story a year ago. I’m tempted to say we did the easy bit, but that would be disingenuous to all the teams that have worked with me to make this place look so fabulous – we’ll come onto them in a minute – but fundamentally we wouldn’t have been able to come into the story a year ago, if it was not for you Annabel and the countless campaigners in this area.” (applause). Lilly then said that with his three decades in the cinema business it is always special to come back and unlock an old cinema building, “but none as special and with such a history as this building,” he acknowledged. This was a fitting tribute to the Picture Palace Campaign that fought to bring a cinema back to Crystal Palace and resisted efforts to convert the building into an evangelical church. While it was a tense question for the council (the church was mainly black and Afro-Caribbean), it was nevertheless decided that the area was well catered for by many different churches (including evangelical) but less so for those that worship the big screen. “Thank you for giving Everyman this extraordinary opportunity,” Lilly concluded to warm applause. 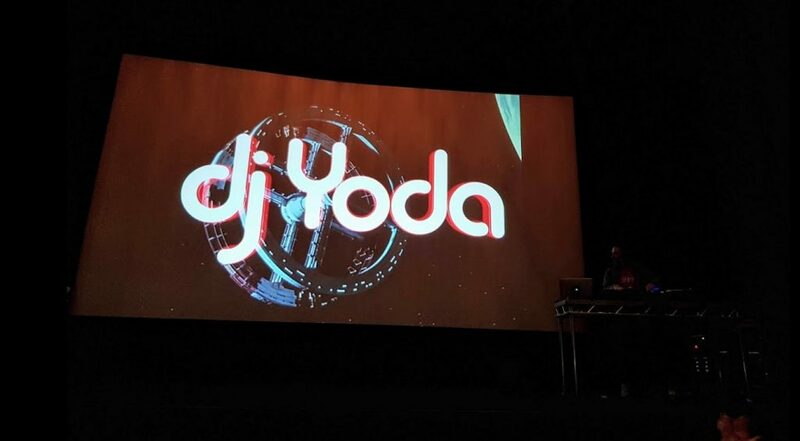 This was followed by a set from Dj Yoda, who did a jaw-droppingly amazing mix of spliced-up movie footage with lip-sync accurate vinyl scratching. (Somebody PLEASE hire him for CinemaCon or CineEurope – and I don’t mean as a background DJ). Afterwards there was more drinking, mingling but more importantly also, film screenings. Screens 3 & 4 were showing “Bohemian Rhapsody”, while Screen 2 showed the original “Jurassic Park”. 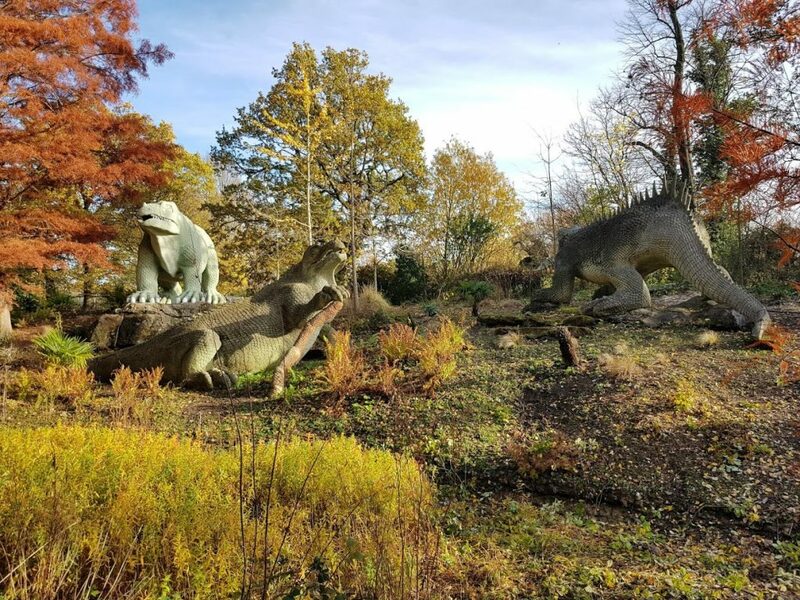 This was again a good local tribute, as Crystal Palace park is known for its 164 year-old dinosaur sculptures, making it the original Victorian Jurassic Park. (For a bonus point*, what connects “Bohemian Rhapsody” with “Jurassic Park”?). Slipping in halfway through Spielberg’s original dino-epic it was hard not to succumb to the plush seating, the free popcorn and a big screen work of pure cinema. Having intended just to watch a few minutes, I ended up staying until the end of the film. And I will no doubt be back for many more. There is no question that Everyman Crystal Palace will do well, whether for films or people just wanting to pop in for a coffee (or a coffee martini). In talking to cinema professionals in Europe, it is interesting how Everyman’s name comes up much more frequently than any of its local competitors. 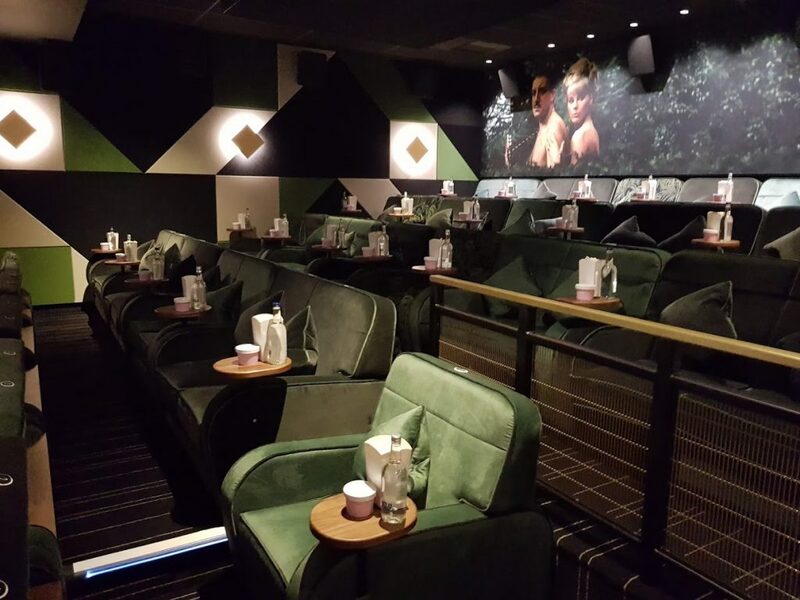 It is clear that Everyman has been the inspiration for both new and restored cinemas, such as Bio Capitol in Stockholm, that sell themselves as an experience and lifestyle choice, rather than just a place to watch films. It is not just cinema lovers who are fans of the Everyman Group. Over the last two years the company’s shares have more than doubled in value, with no doubt many shareholders also loyal customers. The company has also not had any problems to tap the financial markets for funds to expand its concept wide. Next year Everyman is opening seven new sites; significantly only one of these is in London. Everyman is thus taking its winning formula to the rest of the UK, while cinemas on the Continent try to emulate it. Meanwhile Crystal Palace’s residents can rejoice that after 50 years’ absence they don’t just once again have a cinema, but they have one of the country’s best old new cinemas. Unlike the CP dinosaurs, Everyman proves that cinema isn’t going extinct.